I currently work as a dietitian out of the house four days per week. I pack my lunch every single day along with breakfast and snacks. I like to eat all through the day and do lots of small, frequent meals. As I type this post up, I am snacking on some cantaloupe! 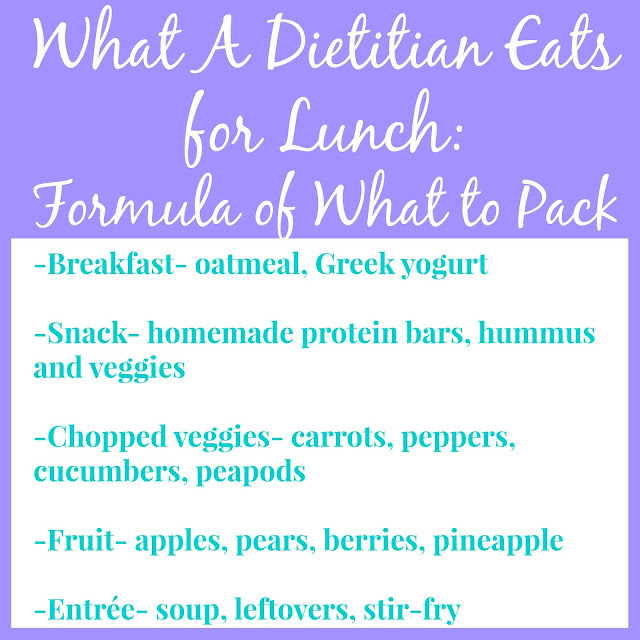 I am so not a creature of habit when it comes to lunch and always pack a huge variety of foods. I love variety and get bored with food easily so pretty much, no two days look the same. I do have a "formula" that I use when it comes to packing my lunches which makes it easier for me to think about what to pack. For breakfast, 90% of the time at work, I have oatmeal. This is mix of 1/2 cup oats, chia seeds and flax seeds topped with nut butter. For a snack, this varies a lot. Sometimes I have a Greek yogurt, a homemade treat that I made such as granola bars, energy balls or protein bars or something else. For my fruits and veggies, I vary this a lot depending on what is on sale or what is in season. A lot of times, I chop up carrots for my veggie since I do not get bored of these too much. Other favorites include cucumbers, green beans, pea pods and bell peppers. I love any kind of fruit including apples, pears, berries, grapes, kiwi, pineapple, etc. The biggest variance is what I bring to work for an entrée. I am not too big of a sandwich person so my husband and I usually make extra food on the weekend to eat for lunches during the week. I love soup for lunch (such as my Cheeseburger Soup or 20 Minute Hearty Vegetable Soup) because it is easy to reheat. 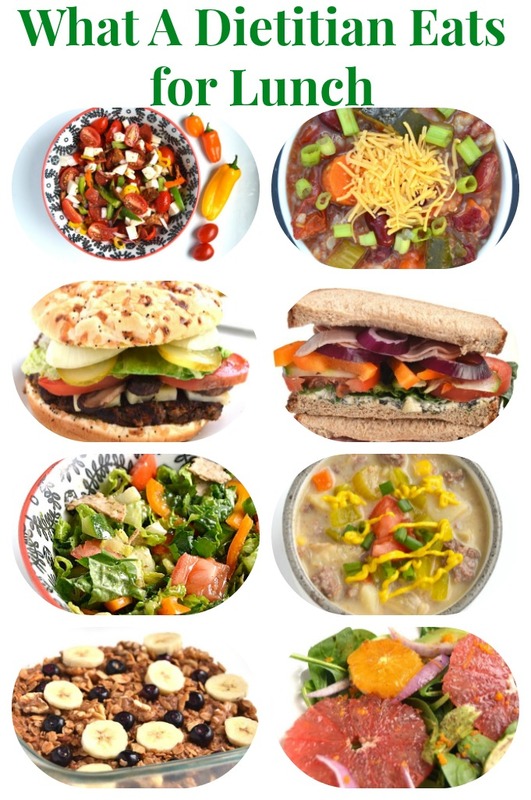 I also love pasta, grilled chicken, big salads (such as Fattoush Salad), bean/grain/veggie salads and more. Anything is game for lunch! I am also blessed to work within a kitchen that the chef makes excellent food. Sometimes, I will eat his homemade soup of the day or something that he makes me like chicken piccatta or chicken parmesan (follow me on Instagram to see some of the awesome things that our chef makes). Sometimes, life gets really busy and I do not have time to make homemade food for lunch and grab something quick like a PB and J or a frozen meal like Healthy Choice Simply Café Steamers. These are perfect when I am rushing out the door and need something tasty but still nutritious. They have 100% natural proteins and no artificial ingredients. They all have less than 310 calories and more than 18 grams of protein. They can be found in the freezer section of your local grocery store. I picked up the Healthy Choice Café Steamers General Tso's Spicy Chicken and was surprised at how good this meal was. It had a lot more veggies than frozen meals usually have. The sauce was tasty and the chicken had a good texture (sometimes frozen meals do not).